My notes suggest I first planted these Wild Oats in 2008, and this spring, at last, they bloomed! 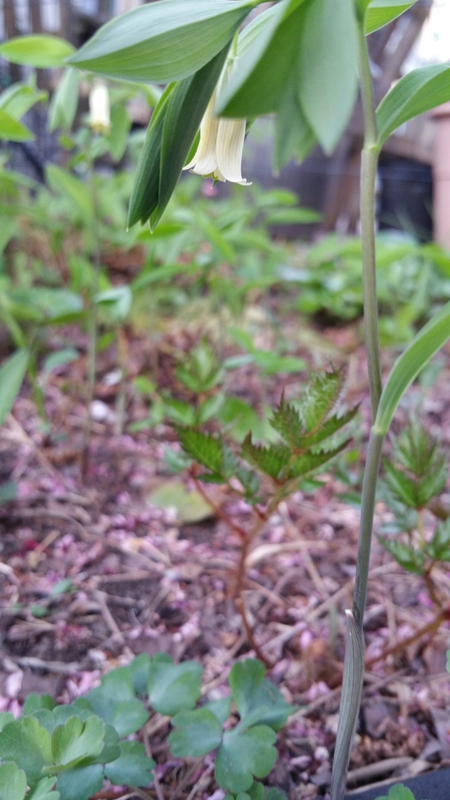 Its larger cousin, the Large-flower Bellwort is a reliable and beautiful early spring bloomer, year after year, and I’ve been able to divide it and start a new clump in the street bed. 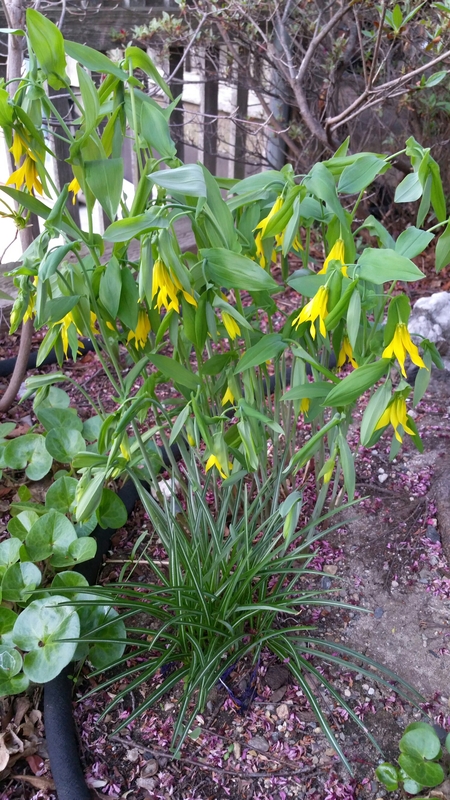 Posted on May 10, 2015 May 10, 2015 Categories UncategorizedLeave a comment on Uvularia! 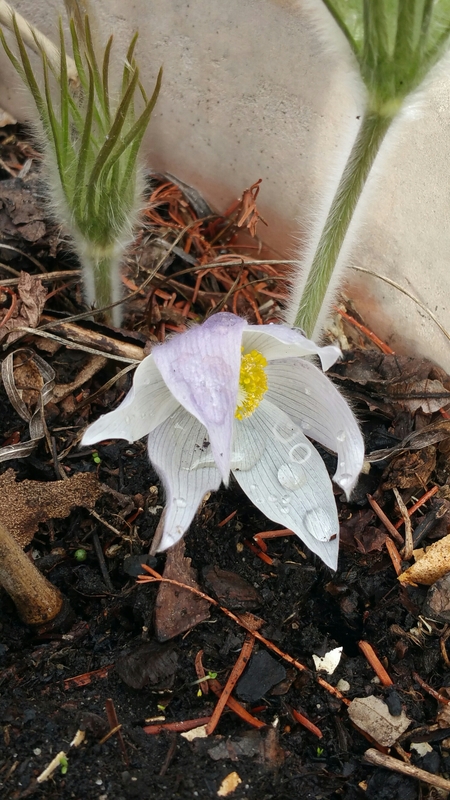 I wait for the pasque flower each year with baited breath. Will it come up again this spring? Will it bloom? And will our dog eat the flower before we get to enjoy it? There’s a wonderful set of children’s books about Henry and his dog, Mudge. In one of them, Henry and Mudge admire a beautiful blue flower together and then…Mudge eats it. It does look delicious, doesn’t it? More info is available here http://www.mountauburn.org/2012/nationalpublicgardensday/. Hopefully the rain will end by Friday and we’ll have a beautiful day to celebrate our public gardens! The Spring 2011 Mid-Cambridge PLANT SWAP will be on Saturday May 12 (not May 5*), noon to 2 pm. Rain date—in case of DOWNPOUR—is Saturday, May 19, 12-2. The Mid-Cambridge plant swap is at Fayette Park (near the corner of Broadway and Fayette St., across from former Longfellow School). Bring anything that’s growing in too much abundance in your garden. Elegant packaging not required, but please do write down the names of plants. We expect to have perennials, biennial seedlings, seeds, indoor plants, catalogs, pots, and lots of “whatever.” Feel free to just come, chat with neighbors, talk gardening. * Please note that this Plant Swap will happen a week later than usual. Our plant swap, at the McMath Community Garden in North Cambridge, is now scheduled for the next day, on Sunday, May 20 (not May 13), from 2 – 4 p.m. Come by and share your extra plants or pick up a free plant from another gardener! I’m hosting a neighborhood plant swap today with the coordinator of the McMath Community Garden (just across the commuter rail tracks). I was out digging up and dividing a bunch of perennials yesterday and plan to do some more today. I hope I’ll have some plant takers! If you live in the North Cambridge area, please come by to share your extra plants, or pick up some free plants – or just encourage us! We’ll be out from 2 – 4 p.m.
Posted on May 22, 2011 Categories UncategorizedTags Cambridge MA, plant swapLeave a comment on Plant Swap Today! 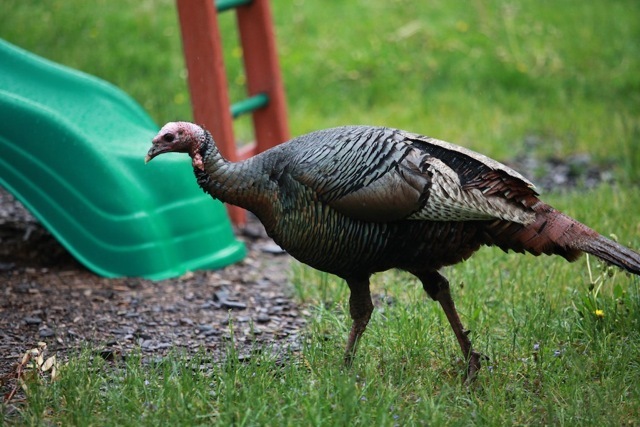 We’ve had a wild turkey visiting Cambridge Cohousing for the last three days. One of my neighbors spotted it early Weds. morning, enjoying some bird seed under a bird feeder in the middle of our front lawn. It’s now taken to wandering around our front lawn and patio, sitting in a large planter in front of our dining room – which does kind of look like exactly the right size for a turkey nest, now that I think about it! 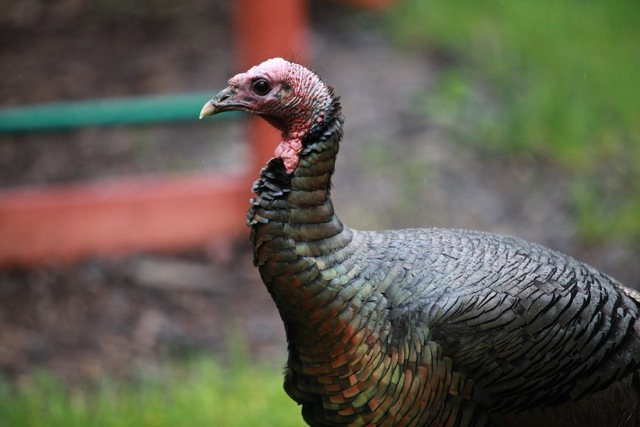 The turkey is not our only recent wildlife visitor. I put my hand into a heath plant yesterday afternoon and surprised a small snake. Last week, my husband surprised a possum in one of our compost bins. Of course, in both cases, the surprise was mutual.